Spring Special-Stay 3 nights, get the 4th FREE! Gorgeous Beach views! Shuttle & Free Wifi Included! No Golf Cart Available! Enjoy making the most of your Sandestin Golf & Beach Resort vacation in this beautifully-appointed two-bedroom Gulf Front Condo! 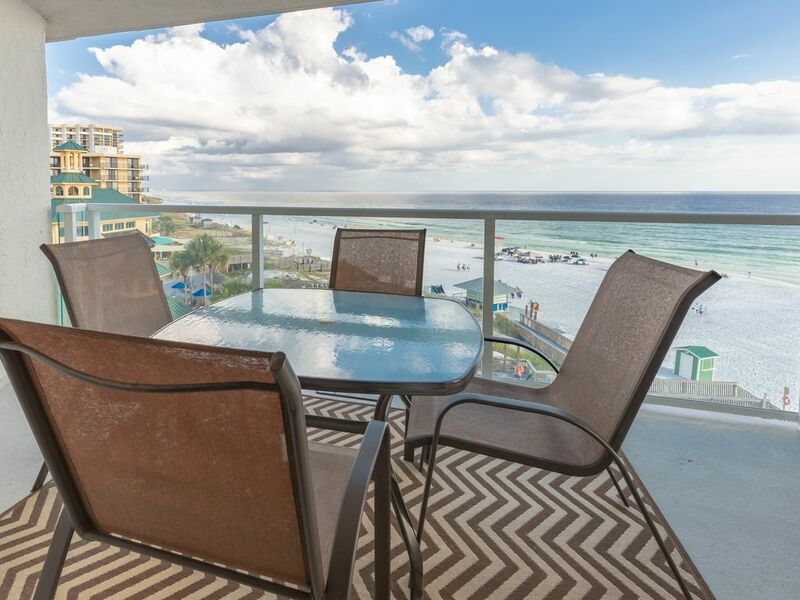 Marvel at the gorgeous view of the sparkling aqua water and sugar white sands of the Emerald Coast beach from your private balcony on the Sixth Floor. Amazing decor with a fully-equipped kitchen boasting rich, dark cabinets, and black appliances. Tile floors and carpeted bedrooms give this condo a clean, open feeling. A comfortable Living Room equipped with a desk/work area and a flat-screen TV and DVD player is like being right at home. The Master Bedroom has a king size bed and a TV and DVD player for your enjoyment, and the second Bedroom boasts a queen bed -- an unusual bedding arrangement from most two-bedroom condos. The bathroom has a combination tub and shower. For added convenience, a washer and dryer is provided. Beachside Two sits directly on the beach just steps away on the beach boardwalk. The building offers its guests WiFi, a seasonally-heated solar pool with grills at the pool deck, an exercise room and covered parking. On those nights you want to enjoy an evening out, The Village at Baytowne Wharf offers an array of restaurants from fine dining to pizza, sushi and more. Or catch the latest movie at Grand Boulevard at the new ten-screen cinema. Free Shuttle Service will take you to all locations on the Resort. Sandestin's 2400 acres has over five miles of paved trails for jogging and bicycling, a nature walk area, three public golf courses and tennis courts for the tennis enthusiast. Location was good, nice view, nice heated pool. Fair amount of construction going on, at times could be noisy, disruptive. Parking was excellent. My mistake in having only one bathroom, two would&#x2019;ve been better. Platinum mgt service was good. Would&#x2019;ve been good if they contacted you after arrival to see if all was ok. Quality of furniture was so so. Amenities in this condo were avg. Maintenance service by Jamie and Jim was excellent. Platinum office personnel were excellent/helpful answering questions. Many restaurants in the area. Nice golf courses nearby. We have stayed at beachside 2 for several years now and have enjoyed our stay each time. We stayed in 4266 and was very disappointed in the cleanliness of the condo. My kids found several food items left on the floor, my husband got athletes foot after our stay there and the beach area was overcrowded with resort chairs and umbrellas that are not even used which left us with very little beach space. We were all crammed together and my kids barely had space to play in the sand which did not make it very much fun. We do apologize that your experience wasn't the best. The months of July and August are the busiest and the area does get overwhelmed with too many folks at times. We still do our best to make sure you have a wonderful experience. Please come back and stay with us again and we will discount your next stay. We would like the chance to give you a platinum vacation experience!! Very nice rental. Rental company was very accommodating by letting us in early and they also met us at the door to make sure we were happy with everything and gave us recommendations on what to do and where to go. Would definitely use again! Hi Julia, We are so thrilled your 4th of July Vacation was everything you expected it would be. We strive to make sure all of our guest share the same experience you had. Remember when you book direct with Platinum Vacations of Destin you do not have to pay a service fee that the 3rd party companies charge. Often times we are also running a discount if you call us directly. Please visit us on social media to learn about our monthly giveaway. We hope to hear from you again in the near future. Nice location, great views, and convenient. Condo is efficient, but not conducive to lounging around in...which was not a problem as we don’t hang out in the condo much anyway...furnishings are simplistic, and this condo is small, but practical for the $$$. Sofa in living area is pretty worn out and there is minimal extra seating to enjoy the inner confines of the condo...but as long as the weather is nice, who cares! Exquisite view from the balcony...easy parking access was a plus....the building and grounds are well maintained. Can’t say we would book this condo again, ....basically no frills but served its purpose. Price was we went with it. Beds are comfortable and everything about it was clean so no complaints there. Hi Charles, We are very pleased that you enjoyed your stay at Sandestin Golf and Beach Resort. I have taken your recommendation about the furnishings and shared it with the owner. We also appreciate the kind words about how clean the condo was upon arriving. Our housekeeping staff works very hard to make sure everything's in order upon an arrival. We do manage about 70 properties at the resort so, please visit our website the next time you plan to vacation in the area. Remember that when you are a guest of Platinum Vacations of Destin you will receive 5% off your next stay. Also, make sure to book direct with Platinum Vacations of Destin to avoid the extra service fee the VRBO, Homeaway, and Trip Advisor charge. We hope to see you again in the very near future. Regards, Platinum Vacations of Destin Management Team. Susan, Thank you for staying with Platinum Vacations of Destin! 'Excellent' is what I love to hear from our guest! I'm glad that you enjoyed your stay! This unit is perfect for weekend getaway at the beach! We would love for you to stay with us again! Please give us a call when you are ready for your next beach getaway and you will receive the 10% off returning guests discount. You can also follow us on all Social Media outlets (Facebook, Instagram and Twitter) and visit our website to stay up-to-date on current specials, as well as enter to win our monthly giveaways!